How should we think about and understand human behaviour? What’s the role of theoretical models? How can – and should – such models be used in practice? And what can we learn from the many different academic and practical perspectives on the subject? 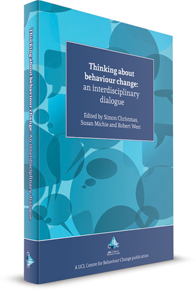 This book, aimed at anyone with an interest in behaviour change, offers a fresh and challenging take on these questions. It comprises a Dialogue, which sets out key debates in a lively and accessible way, and 21 commentaries written from a wide range of standpoints, including academic, commercial and public sector. The original paperback physical book - feel it in your hands. International delivery available. Download the book for your Kindle, Nook or other e-reader. This is a wonderful cornucopia of disciplinary perspectives on the age-old question of why we humans so often act against our own values and goals – undermining population and planetary health, to name but two global problems arising from this. Analysing the theories that provide insight into behavior change is critically important for public health. Doing so in the interdisciplinary context is crucial for patients. Whether you want to understand, research, or implement behavior change, this book will provide you with the tools and roadmap to do so. Changing human behaviour is an example of what we at UCL call a 'grand challenge' – an issue of global significance which requires a truly interdisciplinary response. This book rises to that 'grand challenge', and shows what can be achieved if we talk and listen to each other.